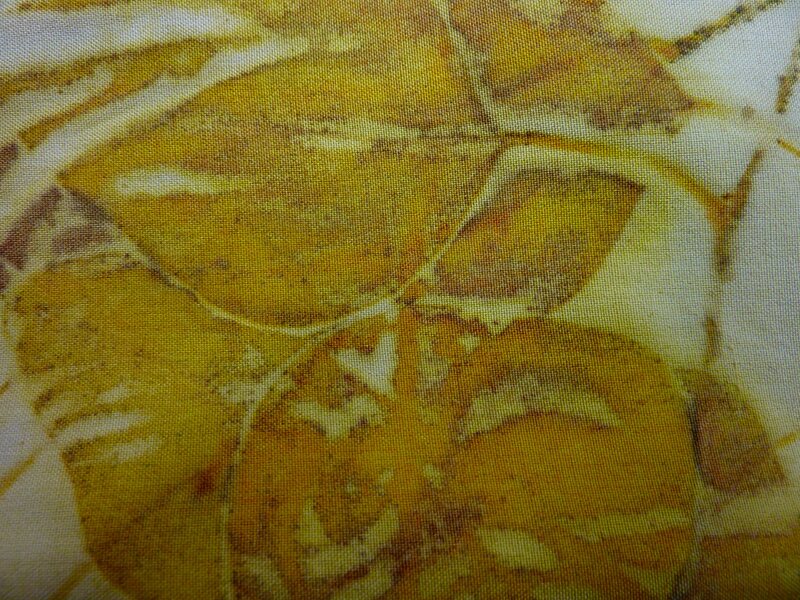 Eco printing again with eucalyptus: Golden Leaves! 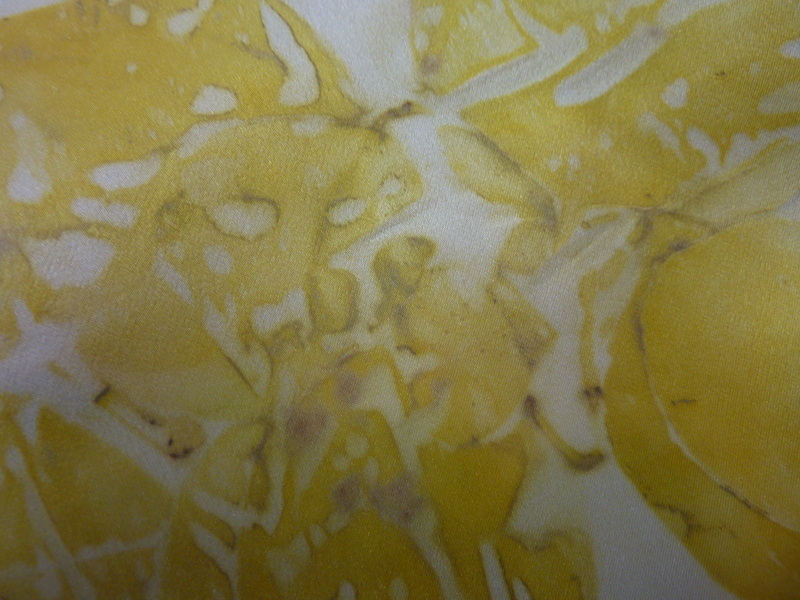 A review of my experiments with eucalyptus so far this Fall: In short, yellow rules! A. 1. Left: Seeded Eucalyptus and Baby Blue 2. Centre: Silver Dollar (E. Cinerea, said the florist) 3. Right: Silver Dollar E. plus Seeded E.
B.1. Left: Silk Fuji (vintage kimono fragment from my stash) steamed two hours over copper pipe (I think…forgot to note that…) . 2. Centre: Silk Charmeuse (stash fragment, new) steamed 90 mins. over de-barked cherry wood (Most likely. I forgot to note that detail…) 3. Right: Silk and wool (80%-20%; new yardage) steamed four hours over (bark-on) hydrangea wood – for sure. Plenty of experimental variables uncontrolled or uncontrollable! 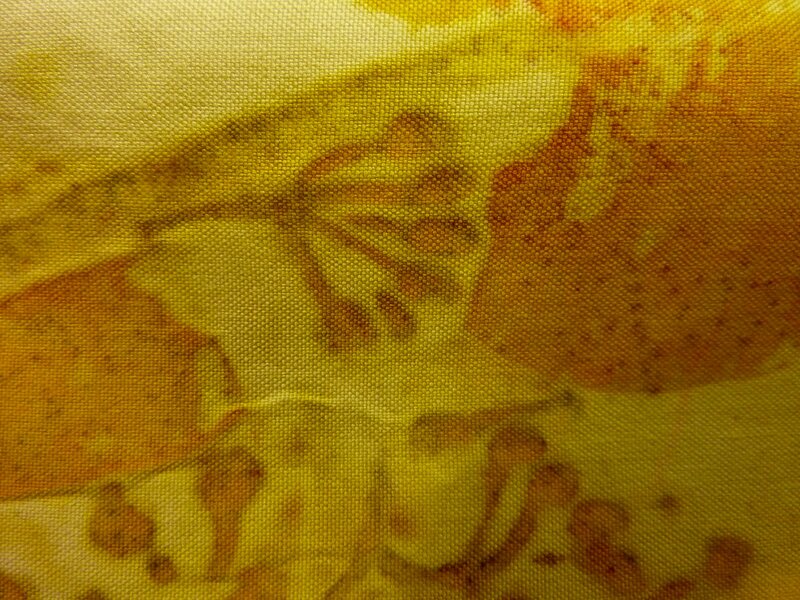 But they all gave the a range of orangey-golden-lemony-yellows on silks, chartreuses too, with reds and darker oranges responding to longer steaming. The dry leaves used for the centre panel (silk charmeuse) had been steeped to the point of fermentation, but the steaming time was shortest. Need to try that one again. 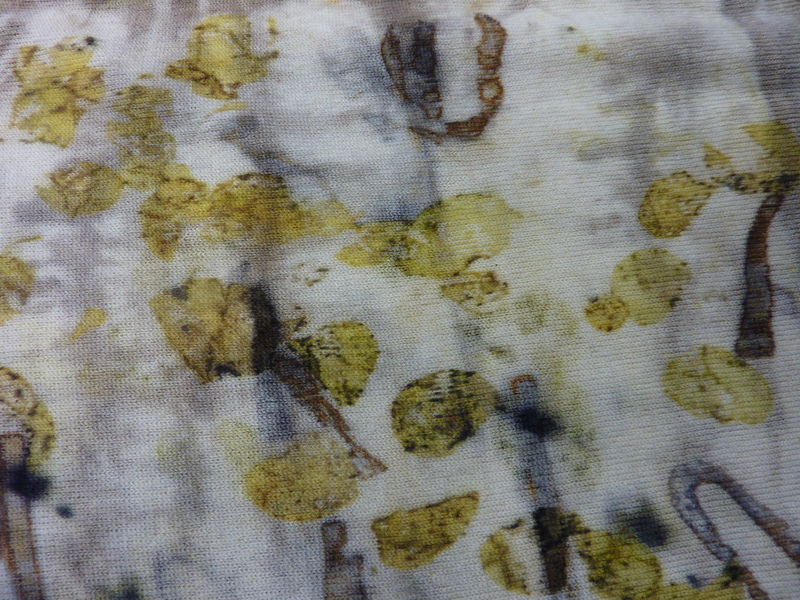 The prints are of Baby Blue and Seeded Eucalyptus. Mordanted with alum before steaming. 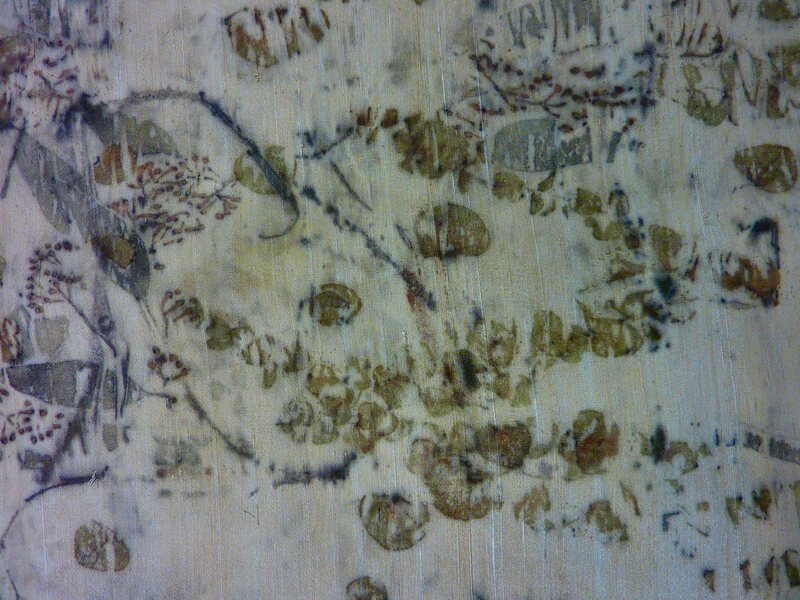 The panel has an oriental scroll-like look to it – more on that one in future posts- it is ripe for life as stitched art cloth. More “eco-euco” later when the silk-wool panels are ready. I received the panels this week and they are to be mordanted in alum acetate. I am trying this kind of alum because I have read (see “Wild Colour” by Jenny Dean) that one can then skip the tannin mordant stage for cellulose (cotton, linen) fibres. No more tannin from my garden now that that snow is here and I will have used up the tannin stock I made this summer from the sumac leaves pretty soon. Last note on mordants: theoretically, eucalyptus and walnut are substantive dyes and need no mordanting for fastness. 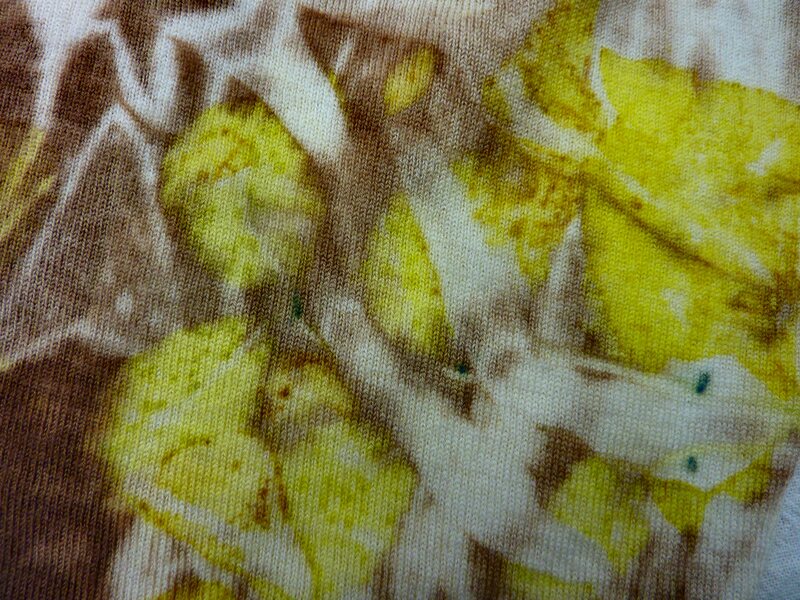 But I mordanted them anyway, since I have read that the substantive colours would likely dye brighter with alum. 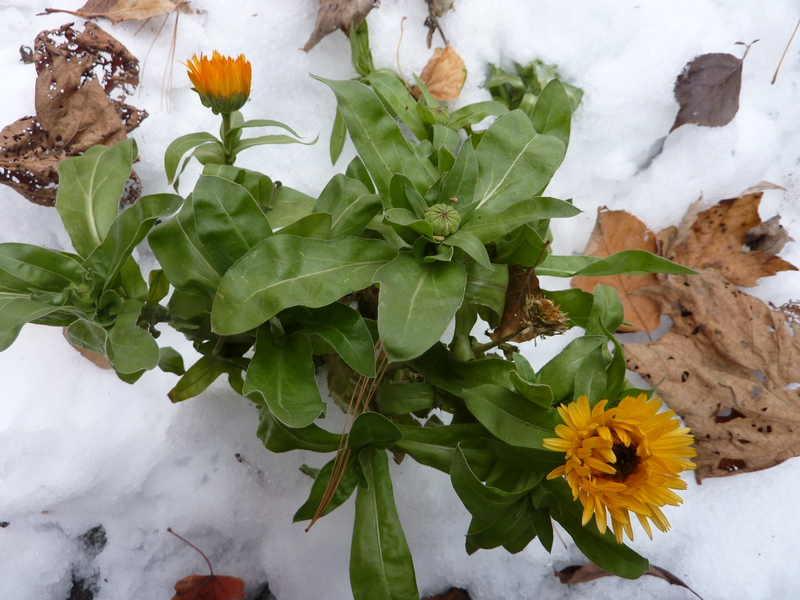 Shakespeare referred to these marigolds as “Mary Buds” (he would not have known tagetes “marigolds”). That is because their name “is a version of “Mary’s Gold”, a reference to the Virgin Mary. Shakespeare said that they opened their golden eyes to the rising sun. Next post: Itching to Stitch! 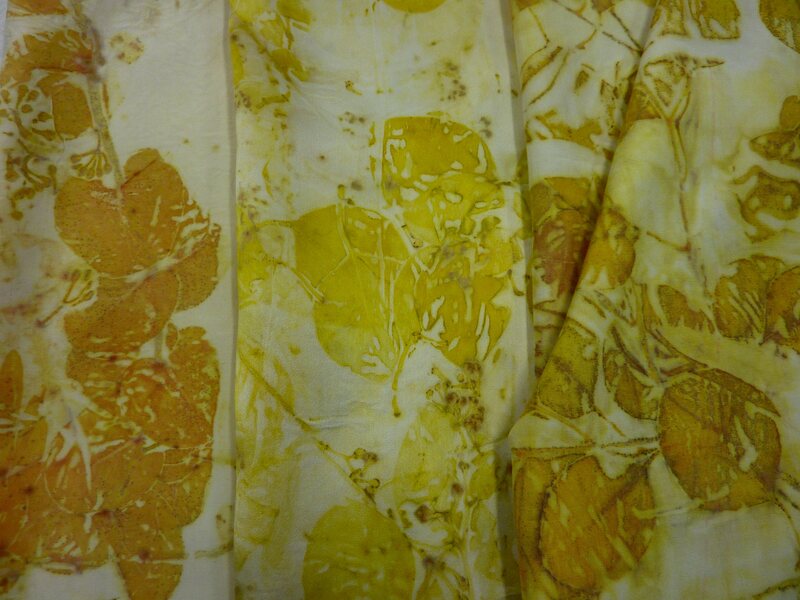 Some pics of my progress on stitching some vintage refectory linens that I eco printed in early summer. Please excuse the erratic formatting these last posts.